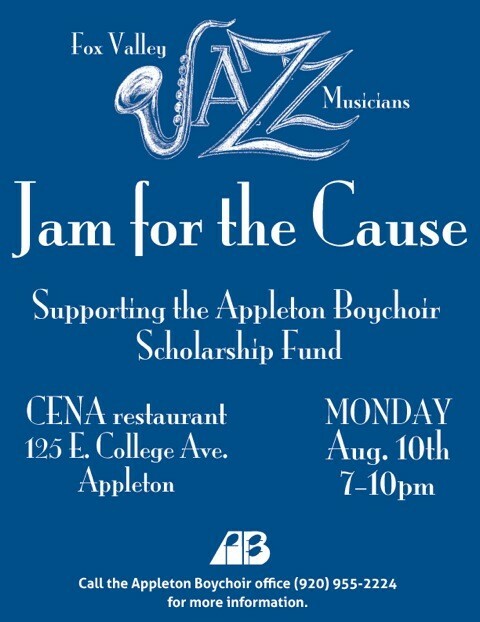 Posted on Aug 8, 2015 by Appleton Downtown Inc.
Fox Valley Jazz Musicians will be holding a “Jam for the Cause” on Mon., Aug. 10 from 7-10 pm at CENA Restaurant, 125. E. College Ave. The fundraiser will support the Appleton Boychoir scholarship fund. There will be no cover charge or tickets, but free-will donations will gladly be accepted. In addition, attendees will have the opportunities such as to “contributing” to request a song played by the musicians or to have a specific musician perform. People can call the Appleton Boychoir office at (920) 955-2224 for more information.